You are here: Home / Topics / Theology / Where was the manger and what was the inn? Like most people, when you consider the traditional Christmas story, you picture Mary giving birth alone in a barn filled with straw and animals because all the hotels were full. You can probably recite the details by heart. You would be wrong. Rev. Bailey has spent 40 years living and teaching in the Egypt, Lebanon, Jerusalem and Cyprus. He brings his impressive knowledge of middle-eastern culture and language to understanding the life and times of Jesus Christ. 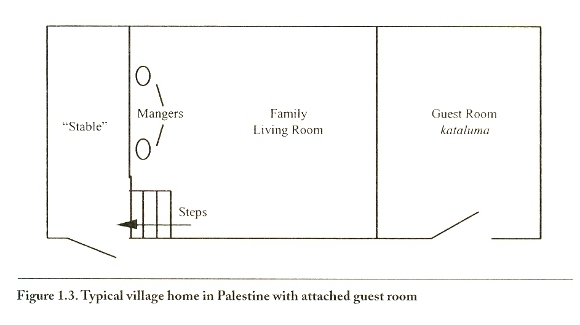 Bailey’s research reveals that, while the wealthy at the time had separate quarters for their animals, the typical village home had only two rooms: the family living quarters and the stable. The stable was lower than living quarters, next to the door, and housed the family animals overnight for warmth and safety. When the family cow became hungry in the night, it could stand and eat from the mangers cut into the floor of the family living room. Wooden mangers for sheep and smaller animals would be placed on the floor of the lower level. To summarize, a part of what Luke tells us about the birth of Jesus is that the holy family traveled to Bethlehem, where they were received into a private home. The child was born, wrapped and (literally) ‘put to bed’ in the living room in the manger that was either built into the floor or made of wood and moved into the family living space. Why weren’t they invited into the family guest room, the reader might naturally ask? The answer is that the guest room was already occupied by other guests. The host family graciously accepted Mary and Joseph into the family living room of their house. Bailey’s work shows the importance of stripping away our cultural presuppositions when we approach the Bible.